Have you ever been led by weak leaders and strong leaders? You may or may not be able to pinpoint the specific reasons certain leaders may be strong or weak, but you can definitely tell the difference when you spend enough time around them. Being an excellent, strong leader that people will follow is a special gift. The Bible is filled with numerous examples of great leaders, people such as Moses, Joshua, Samuel, David, Jesus, Peter, and Paul. One of my favorite Biblical leaders is Nehemiah. To my recollection, there is not one negative characteristic of his leadership style mentioned in Scripture. The book of Nehemiah has many great leadership lessons. In this post, though, let's narrow our focus down to only three. First mark of leadership - prayer and preparation (chapter 4). As Nehemiah and the Jewish people began the massive construction job of putting Jerusalem's walls back together, they came under attack by their enemies living in the land. What was Nehemiah's response? First, he prayed for God's help (4:4-5,9). Second, he prepared for possible attack by stationing a 24-hour guard (4:9-14). Nehemiah prayed as if everything depended on God and then prepared as if everything depended on him and the people. 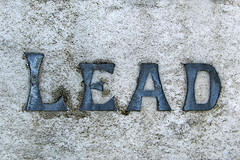 Second mark of leadership - don't demand too much from an already struggling people (chapter 5). Apparently, the average Jew living in their native homeland during this time was in massive debt. In order to even pay their taxes and interest, they had sold their land as well as their children into slavery to the Jewish wealthy elite. Nehemiah gathered the nobles and officials, and he shared his concern regarding the enslavement of the people. Nehemiah along with these other wealthy leadership agreed to stop charging interest as well as return property to their fellow countrymen. As acting governor of the territory controlled by the Persian Empire, Nehemiah could have demanded much in order to live the "high life" while he was in Jerusalem. In 5:14-19, Nehemiah explains how he cut back on these traditional gubernatorial expenses so as to not be a burden on the Jewish people. He sacrificed his own personal rights as the leader for the greater good of his people. Third mark of leadership - ignore the annoying distractions (chapter 6). In this chapter, we see the enemies of God - Sanballet, Tobiah, and Geshem - attempt to discourage and distract Nehemiah from everything he was doing to rebuild the city of Jerusalem. Nehemiah ignores their plot to distract and harm him. He gives this now famous response, "I am doing a great work and cannot come down. Why should the work cease while I leave it and go down to you?" (6:3, HCSB). Nehemiah kept his focus on the task God had for his life and ignored those who were trying to distract him. What's Your Leadership Style Like? Most of us are leaders in some area(s) of our lives. We provide leadership in our homes, communities, workplaces, and churches. After looking at the life of Nehemiah, consider these three unique marks of excellent leadership. Are you praying as well as preparing for challenges as you lead? Are your demands appropriate for those whom you lead? And, are you ignoring all the annoying distractions that surround you? How can you incorporate characteristics of Nehemiah's leadership style into your own unique style?